Turkey will continue efforts to defend its sovereign rights in the Eastern Mediterranean and promote the country's position as a key energy player in the highly contested region and will not allow any violation of these rights. "Turkey will not allow any fait accompli regarding the hydrocarbon resources in the Mediterranean," Energy and Natural Resources Minister Fatih Dönmez said Friday. "We do not want to escalate any tension in the Mediterranean and will continue our exploration activities in the region," the minister said and added, "We do not eye any other country's resources, but we do not also tolerate any intervention in our operations. We will defend the rights of Turkey and Turkish Cypriots in the Mediterranean," added Dönmez. Turkey's first drillship, Fatih, named after Istanbul's conqueror Ottoman Sultan Fatih Sultan Mehmet, launched well-drilling operations on Oct. 30. The 229-meter vessel is capable of drilling to a maximum depth of 12,192 meters. The first well is planned to reach a depth of 5,500 meters. 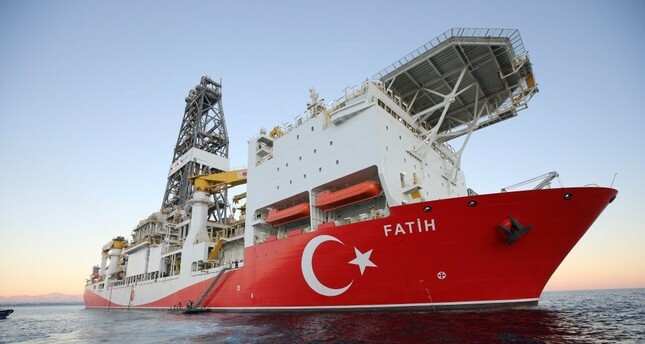 Turkey is also planning to add a second drilling vessel to its fleet. It will secure Turkey's rights in the Mediterranean as per international law. "The new drillship will carry out operations in the Black Sea," Minister Dönmez announced. The country's first seismic vessel, Barbaros Hayrettin Paşa, which was bought from Norway in 2013, has been conducting exploration operations in the Mediterranean since April 2017. As a result of the analysis of seismic data, Dönmez said, the decision to drill the first well was made. Additionally, Turkey's second vessel, the MTA Oruç Reis, which Turkish engineers built at a local shipyard in Istanbul in June, is undertaking exploration work in the Black Sea. Minister Dönmez highlighted that the mutual respect of rights and international law constitutes the foundation of Turkey's governance paradigm. "Turkey has taken all steps within the framework of law, and the country will take all the necessary measures to ward off any act that violates its own rights," the minister said. Greek Prime Minister Alexis Tsipras in an interview on Alfa TV late Thursday called on Turkey to resolve the maritime dispute in the Mediterranean. "Turkey is an effective and critical power. Greece has created the conditions to create an energy map of the Eastern Mediterranean together with other countries," Tsipras said. The Greek prime minister stressed that Turkey must make a decision regarding the status of the resources in the region. The plan to gradually extend Greece's territorial waters from 6 miles to 12 miles in the Ionian Sea was received as a casus belli by Turkey in late October. With regards to the issue, Greek Prime Minister Tsipras said, "This is not a new issue, we will seek protection [of] our rights." Recently, Tsipras decided to skip the option of presidential decrees and seek the approval of the parliament to ensure broader political consent on the extension of Greece's territorial waters. According to the original plans, as revealed by former Foreign Minister Nikos Kotzias, the extension would take place through presidential decrees. But Tsipras seems to be targeting a broader political consensus and therefore will take the issue to the parliament with the relevant legislation.